In this page, we'll integrate Pingdom with DNS Check, so that Pingdom can take advantage of DNS Check's DNS record monitoring capabilities. We'll do this by combining an HTTP check in Pingdom with the DNS Check API. Pingdom provides website monitoring, including the ability to check A and AAAA records. Unfortunately, Pingdom by itself does not support monitoring other types of DNS records, such as MX records. This is where DNS Check comes in. 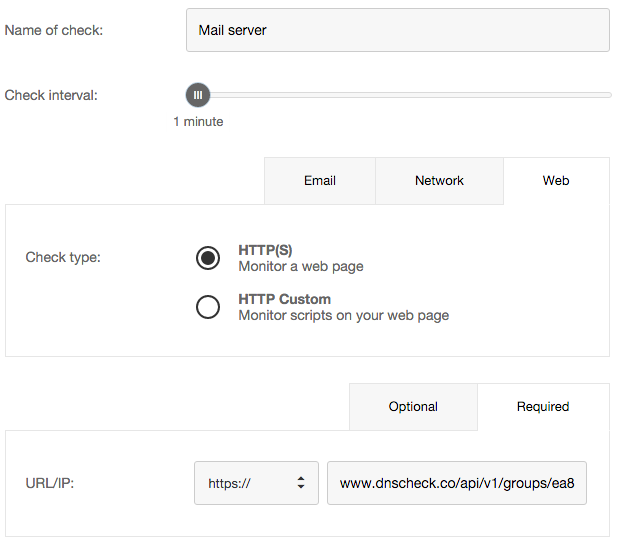 DNS Check provides an advanced DNS record monitoring service which allows you to monitor sets of DNS records for errors. DNS Check enables you to do things which most other DNS record monitoring tools don't, like check MX and SPF records, specify that a DNS record should be the only record of its name/record type combination, and import entire zone files for monitoring. We usually recommend monitoring DNS record groups, since that allows you to logically group your DNS records in a way which usually simplifies the Pingdom configuration. For example, you could create a single DNS record group that monitors all DNS records that relate to your mail servers. Check out the DNS Record Groups document for more details on what DNS record groups are, and how to work with them. Create a DNS record group, then import the DNS records that you'd like to monitor. The Monitor DNS Records document describes how to do this. Generate a DNS Check API key. We'll use this in the next section. ea883d67-d9f6-45e3-b3a1-844dd1857824 - replace this with the UUID of the DNS record group that you'd like to check. The UUID is the 36-character string that follows "/tests/" in the DNS record group URL. For example, This DNS record group's UUID is "ea883d67-d9f6-45e3-b3a1-844dd1857824". ?api_key=YOUR_API_KEY - replace "YOUR_API_KEY" with the DNS Check API key that you generated earlier. After you've constructed the URL to check, you can view it in your web browser to verify that it's working correctly. The above is all that's needed if you wish to check a DNS record group. If however, you want to check a specific DNS record, you'll need to add one more parameter, which represents the DNS record's ID. If you would rather monitor an individual DNS record than a DNS record group, you'll need to add one more parameter, which represents the DNS record's ID. Notice that the only characters that were added to the DNS record group's URL were "/8". A DNS record's ID is the number that follows the UUID in the DNS record's details or history URL. For example, This DNS record has an ID of "1". Log in to your Pingdom account. Click on the Optional tab. Set the remaining fields to your desired values, then click Create Check.